The Scarecrow and his henchmen break into the Gotham Broadcasting System soundstage, appearing as though they are robbing a game show. Batman and Robin intervene. During the fight, Batman is hit with Scarecrow’s fear gas. He thinks Robin is killed and he tries to kill Scarecrow in retaliation. In fact, the Scarecrow has already gotten away (having successfully planted a secret broadcasting device), and Batman is attacking the network executive, Evans. Batman and Robin return to the Batcave, where Batman is clearly still under the effects of the gas. Meanwhile, Scarecrow and his remaining henchman return to the television station the day of the “Beat Brothers” reunion broadcast. Back in the Batcave, Batman realizes the Scarecrow is using the television broadcast to spread fear, and he and Robin speed back to the station. Once there, they find and confront the Scarecrow, and stop the broadcast just in time, over the loud protests of Evans. 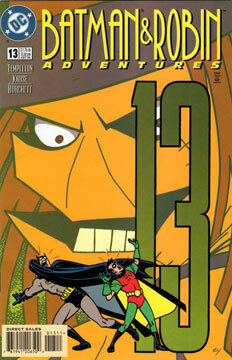 In the end, the Scarecrow is returned to Arkham, and the “Beat Brothers” disband once again. This is a decent middle-of-the-road story, in terms of quality. It’s a typical “Scarecrow tries a new tactic, while Batman shakes of the fear gas” kind of tale. And that’s fine. But it hardly breaks new ground. Kruse and Burchett are a little weak this time. Everyone appears on-model, but there’s not a lot of energy. And Scarecrow is colored a little odd, with lots of brown instead of red. That’s okay, though. Maybe it’s a new outfit. Only Scarecrow’s new color scheme.